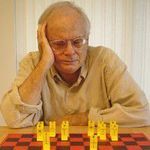 Robert Abbott (born March 2, 1933 in St. Louis, Missouri; passed away February 20, 2018) is an American game designer and former computer programmer who is known for his mathematical abstract games. His games were discovered by fellow game designer and mathematician Martin Gardner when he moved to New York City around the late 1950s. His popular games Code 777 and Confusion: Espionage and Deception in the Cold War were reprinted around 2011 by Stronghold Games.